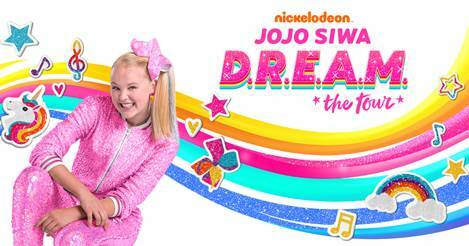 Tickets On Sale To General Public on Friday, Nov. 16, at 10:00 a.m.
Nickelodeon star and YouTube sensation JoJo Siwa announced live on her YouTube channel to millions of fans that she is embarking on her first multi-city, live concert tour: Nickelodeon’s JoJo Siwa D.R.E.A.M. The Tour. Making stops in 25 cities across North America including Los Angeles, Seattle, Denver, New York and Atlanta. Siwa will kick off her show at the Comerica Theatre in Phoenix, Arizona on May 17, with the final performance at Bass Concert Hall in Austin, Texas, on June 26. The news was announced today at a special fan event held at Sugar Factory American Brasserie in New York City. The tour stops in Cleveland on June 11, 2019 at the KeyBank State Theatre. Visit playhousesquare.org for more information. Fans who subscribe to JoJo’s Siwanatorz email club will have access to purchase presale tickets beginning Nov. 13, at 10:00 a.m. Fans who purchase VIP tickets online will also receive exclusive limited edition JoJo Siwa merchandise. American Express® Card Members can purchase tickets before the general public beginning Nov. 14 at 10:00 a.m. local time through Nov. 15 at 10:00 p.m. local time. Tickets go on sale to the general public on Nov. 16, at 10:00 a.m. at JoJoDREAMTour.com. The music video for “D.R.E.A.M.” was released on Siwa’s YouTube channel on Nov. 3. and to date has garnered over 2.1 million views. The full EP is available on Nov. 16 on all digital service providers. Siwa just launched her first animated shorts series, The JoJo & BowBow Show Show starring Siwa and her furry best friend BowBow. She also works alongside Nick Cannon in Nickelodeon’s hit competition series Lip Sync Battle Shorties. She has also appeared on various Nickelodeon live-action series including School of Rock and The Thundermans. Siwa performed at Nickelodeon’s 2018 Kids’ Choice Awards and has won two blimps for Favorite Viral Music Artist in 2017 and Musical YouTube Creator in 2018. This summer, she performed atNickelodeon’s 2018 Kids’ Choice Awards Mexico. AEG Presents is one of the world’s largest live music companies. The company is dedicated to all aspects of live contemporary music performances, including producing and promoting global concert tours, regional music events and world-renowned festivals. AEG Presents operates in North America, Europe and Asia through 22 regional offices that support its tours which include such artists as Taylor Swift, Paul McCartney, The Rolling Stones, Justin Bieber, Katy Perry, Elton John, Panic! At The Disco, Celine Dion, and Kenny Chesney; produces over 40 music festivals, including the iconic Coachella Valley Music & Arts Festival; New Orleans Jazz & Heritage Festival, Stagecoach California’s Country Music Festival, Desert Trip, Firefly Music Festival, Hangout Music Festival and Panorama and owns, manages or exclusively promotes in more than 80 clubs and theaters worldwide. AEG presents more than 8,000 shows annually worldwide and conducts business under such globally renowned brands as AEG Presents, Goldenvoice, The Bowery Presents, Concerts West, Messina Touring Group, Marshall Arts LTD, and Madison House Presents. For more information visit aegpresents.com.